Now that Little Pea is a toddler, I make these oatmeal squares for her. I cut them smaller so they fit her bitty little hands, but other than that, the recipe is the same. The squares are almost like a very moist, dense cake—they’re similar to a bread pudding, not dry and crumbly like some other baked oatmeal recipes I’ve tried, so they’re a perfect breakfast for baby-led weaning or transitioning from purees to finger foods. 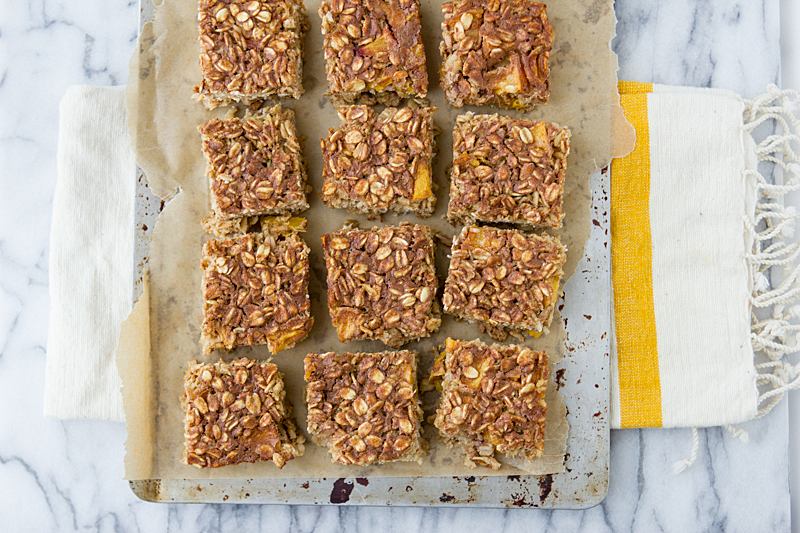 As I mentioned above, you can customize these baked oatmeal squares with any kind of fruit, nuts or seeds you like. I’m not quite ready to say good-bye to summer just yet, so I used fresh, local peaches, but if you’re in a fall kind of mood, apples and pears are fantastic in this. Mango and coconut flakes, strawberries, raspberries, and raisins are other favorites. 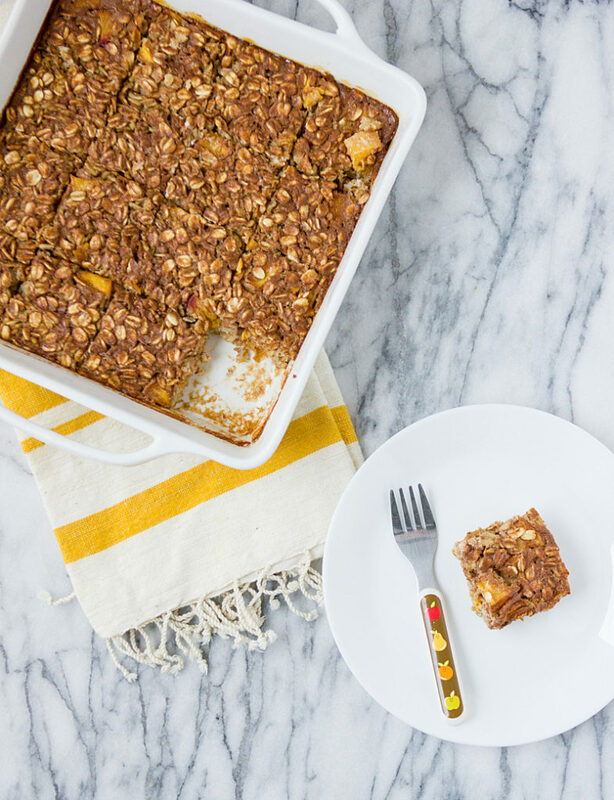 These baked oatmeal squares are the perfect size for toddlers. Substitute seasonal fruit for the peaches when they're not in season. Preheat oven to 375ºF. Spray an 8x8-inch baking dish with oil. Combine the oats, cinnamon and baking powder in a large bowl. Beat the egg in a small bowl, then stir in the milk, vanilla extract, and honey. Pour the wet mixture into the bowl with the oats and stir to combine. Fold in the peaches. Transfer the oats to the prepared baking dish. Bake for about 35 minutes, or until the oatmeal is set and just beginning to brown at the edges. Let the oatmeal rest for 5 minutes, then cut it into squares and serve. If you're freezing them, allow them to cool in the baking dish and then cut them into squares. Place the squares on a parchment-lined baking sheet and put them in the freezer until they're completely frozen through (about 3 hours). Remove the oat squares from the baking sheet and place them in a freezer bag. Keep them in the freezer for up to 3 months. To reheat the squares, bake them in the oven at 350ºF until warmed through (15-20 minutes) or microwave them for 45-60 seconds.